Home » Blog » I’m Nominated for Best Variety Blog! I’m Nominated for Best Variety Blog! 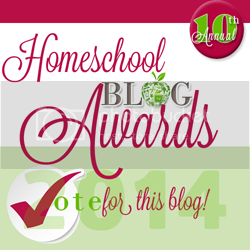 Imagine my surprise when I discovered I’ve been nominated for… Best Variety Blog over at the Homeschool Blog Awards!!! After reading Angela’s astonishment at being nominated for Best Nitty Gritty Blog (perfect nomination for her!) I wandered over and received my own pleasant surprise. Oh wow, always keeping you interested in coming back for more, I sure hope so. I do know I have some delightful, loyal readers and commentators, and I thank you for being you. A big thank you to the lovely person/s who nominated me, I am honoured and humbled. There is a great roll up of bloggers for the Awards, this year, some familiar and some new ones to discover, in 20 different categories! A shout out to those I know, though I’m sure the others are just as worthy, a great way to spread the blog love. As I look over the list I’m sharing with you, I realised I have forged real (albeit online) and precious friendships with most. Women whom I otherwise would never have ‘met’, whose friendships have enriched my life. 12 Comments on I’m Nominated for Best Variety Blog! You certainly deserve the nomination. I voted for you! Love all the blogs and so happy for You as well!! You're certainly deserving. You've a lovely blog. I stop over often but don't comment much due to time. I do enjoy all of your posts though! Daybooks, QTs, everything! I am honored to be nom in 3 categories.Campfires and Cleats….. No one is more surprised than me! I'm up for Encourager, Photos and Nature/Field Trip Blog! I'll be casting votes for you,my friend! Congrats. Thank you for your sweet words. Much appreciated! Congratulations,Erin! Best variety is the perfect category for your blog. Thank you so much for mentioning me and my blog. God bless! Yay Congratulations to you! And thank you so much for mentioning me here! Thanks friends for the kind words and votes. I do appreciate the heads up to know your're reading here too, that way I get to discover your blogs too:) and glad to introduce you to new blogs.